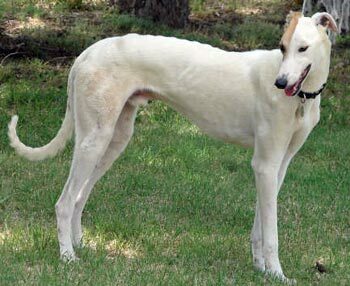 Rock, aka Catch A Glimpse, is a 19-month-old, white and red male, born October 18, 2007. His sire is CTW Legendary, making his grand-sire the late famous Molotov, and his dam is CTW Outa Da Box, making his grand-sire the famous Irish bred Fortress. Rock, along with Little Eva, was turned into the Amarillo Animal Shelter as a “landlord release” weighing only 54 pounds. There are no races to his credit on Greyhound-Data.com, so it is suspected he was used as a match racer. Rock has now put on the necessary weight to have all his medical procedures completed, and he is ready to find his forever home! You can see his before picture below – what a transformation!!! 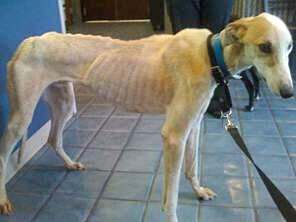 His foster home has done an excellent job of caring and fattening this boy up! Rock is not cat tolerant and has not been tested with small animals yet.